Sometimes, despite your best efforts, photos that you take for your blog end up looking too dark or too light. By using photo-editing software such as Picasa, you get a second chance because you can adjust brightness and contrast. Open Picasa and, in the Library, double-click the photo that you want to edit. Click the Tuning tab on the left side of the application. On the Tuning tab, drag the slider bar below Highlights to adjust the brightness of the image. 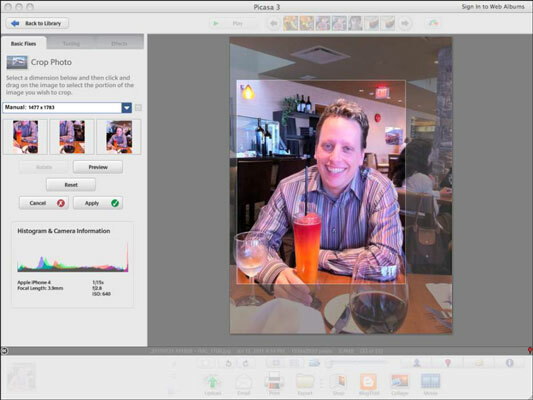 Picasa adjusts the image being displayed while you move the bar. If you’re lightening the photo, watch the brightest parts of your photo to make sure that they don’t get too bright, losing information you want in the photo. If you’re bringing down lightness, watch the darker areas of your photo so that you don’t end up with too much black in your photo. Let your eyes be the judge of a well-adjusted image. You can have Picasa make an educated guess about the brightness settings that you need by clicking the Auto Contrast button in the Basic Fixes tab. Click the Undo Auto Contrast button if you don’t like the results. Click the Preview button and check out how the cropped photo will look. Click the Apply button to crop your photo. Picasa displays the cropped photo.